Transport map of public transport in Sofia, super useful! 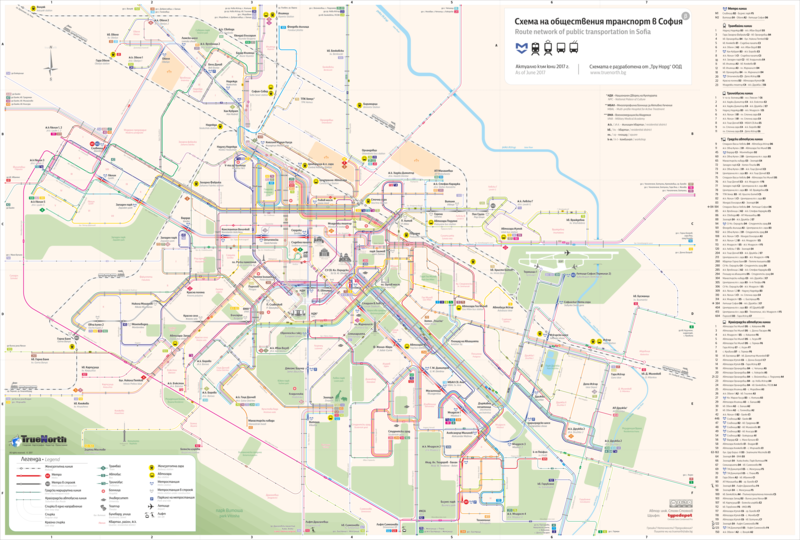 Have you been searching CURRENT map of public transport in Sofia? You already found: Route of public transportation of Sofia, the capital of Bulgaria, include Sofia tourist map, airport map and Sofia metro map. The map is in both Bulgarian and English language. Imagine that you are from the different country, outside Bulgaria and you come to the our capital and you can not navigate in the city or how a stranger digging for hours to find a map of public transport in Sofia? It would be very inconvenient or face it - embarrassment. Transport in Sofia city is terrible and the current scheme (map) which is free and public is so useful. The latest map of all transport in Sofia, Bulgaria is made by an engineer Stoyan Stoyanov from True North Ltd. and is current at the end of June 2017, for which every Bulgarian has to thank him!